Subscribe to our mailing list and be better informed on investment topics. The first quarter of 2019 was the best for stock prices since 1998, to such an extent that some caution may be advised in the short term. While the stock market has been climbing, Wall Street analysts have been lowering earnings estimates for the first quarter. In fact median EPS estimates have fallen by 7.2%, which are some of the largest cuts to S&P 500 earnings estimates in years. This is a source of concern. 2019 is likely to be volatile, but it is unlikely that the U.S. falls into recession. The one thing that could change that is if the partial U.S. government shutdown lasts long enough. By most measures, there is great strength in the economy at the moment, due in part to government stimulus measures, of tax cuts and increased government spending. The U.S. GDP grew at 3.2% in the first half of 2018. U.S. corporates earned record high profits in the first two quarters of 2018. For the third quarter, total earnings of S&P 500 companies are likely to be up by 17.8% on 7.1% higher revenues. The stock market had a strong 2017, supported by strong corporate earnings, healthy economic growth, and the prospect of US tax cuts. and foreign cash can be repatriated at a 15.5% rate. This is unquestionably good for stocks as these tax cuts go directly to the bottom line of businesses. The question is, to what extent is the tax reform already built into the market? Looking ahead to the fourth quarter, we can focus on three things which will impact the financial markets: the Trump tax plan, corporate earnings, and the Federal Reserve. Trump’s administration has undergone huge turnover in its first nine months, including his first national-security adviser, the deputy national-security adviser, his original chief of staff, a press secretary, two communications directors, his chief strategist, the director of the FBI, the acting head of the Justice Department., and the head of the Department of Health and Human Services. Midway through 2017, the optimism that fueled the stock market higher after the Trump election has not yet materialized into better economic data. So far the economy is growing at an anemic 2% as it did during the Obama presidency. Job growth, investment spending growth, consumer spending growth are slower in the first six months of this year relative to 2016. Even the Federal Reserve officials have begun warning that the stock market is overvalued. The Fed has notably shifted from a dovish stance to a more hawkish one over the past month. signaling higher rates, which represent a tightening of financial conditions. The United States government is facing a fiscal cliff on April 28. The most recent government spending law, which was negotiated between John Boehner and Barack Obama in October of 2015, expired on March 15 of this year. Since 1960, Congress has acted on 78 different occasions to either raise or extend the debt limit, or to change its definition. In the next four weeks they must do so again or risk default. In 2011, lawmakers failed to do so on time, which resulted in S&P downgrading the US government's credit rating for the first time in history. The reason why this issue has importance now is because of the unusual levels of contentiousness within the Congress. 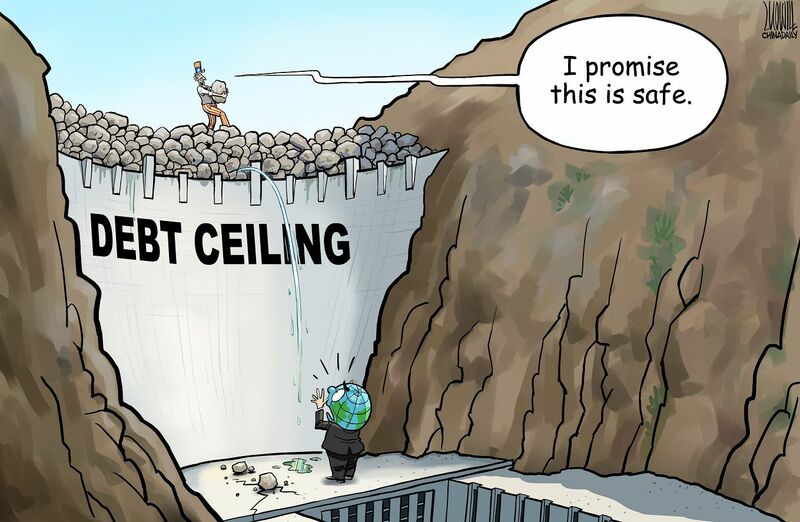 In order to raise the debt ceiling limit, Republican lawmakers need Democratic votes, which are unlikely unless there are considerable concessions towards the abandonment of the Trump border wall and the abandonment of the defunding of Planned Parenthood. In what amounted to a tumultuous first 100 days in office, the Trump administration now faces the increasingly difficult prospect of pushing through a controversial agenda. The refusal by the GOP to pass a repeal of Obamacare after eight years of criticizing it, has Wall Street questioning whether the policy initiatives that caused the Trump rally will actually take place. One well-known Wall Street firm reacted with this title in a recent research piece: "Icarus, then Humpty Dumpty", demonstrating that investors are now increasingly concerned the tax cuts and infrastructure spending are looking unlikely. After initially rallying after the election, companies with the highest tax rates are now lagging the S&P, while US stocks have traded only in line with the rest of the world, and behind European stocks. There are now doubts around the scope and timing of the Trump tax plan, and we are less likely to see comprehensive tax reform and more likely to see only a few small face-saving tax cuts. This too is important. The post-election rally was primarily based upon the belief that the Trump administration could deliver corporate tax cuts, bringing the corporate tax rate from 35% to 20%. Trump’s overall tax plan would have come with a price tag of $12 trillion over the next 10 years, according to the conservative research group The Tax Foundation. In order to fund these tax cuts, the Trump administration proposed border tax of 20% to be imposed on all foreign goods. This tariff is widely opposed by Republican senators, business leaders, and consumers, who would face an immediate increase in the price of any imported good or domestic good using foreign raw materials in its manufacture. Without a mechanism to pay for grandiose tax cuts, they will not take place. Senate Majority Leader Mitch McConnell recently expressed skepticism over whether tax reform could take place before the August congressional recess. This is perhaps because the US tax code is nearly 75,000 pages long, and changing it "comprehensively" is unlikely in the next 120 days. Beyond that we are into fiscal 2018. At the time of this writing there is no clear White House tax plan, and there is not enough staff to even address it comprehensively. The US dollar which rallied in the six weeks after the election has now given up half of its gains, while the Mexican peso has regained all of its losses in the same period. As for infrastructure spending, it remains to be seen if a fiscally conservative Senate will allow it. One question that investors might ask themselves is whether or not the Republican Party actually supports President Trump off-camera. The Federal Reserve hiked short-term interest rates on March 15 for the third time since the financial crisis, signaling two or three more hikes this year. The real test of the economy will be determined by whether the US can withstand positive "real" (after inflation) rates. Recall that on an inflation-adjusted basis, interest rates are still negative. The US central bank is finally ending its nine year period of stimulus after the 2008 financial crisis, although there are few signs of any pickup in economic growth in the first quarter. By any number of measures, the stock market remains very expensive. The CAPE ratio, which represents inflation-adjusted stock prices divided by a 10 year average of stock earnings, is nearly twice its historical average of 15 and three standard deviations from its average. Put in a historical context, the CAPE index is at its 96th percentile of expensiveness, beyond where it stood in 2007. We can compare this number to 1929 peak valuation levels, when the stock market hit the 97th percentile of all time expensiveness. The price to sales ratio of the S&P 500 has bypassed two standard deviations from the mean, and is approaching levels similar to the technology crash in 2001. Another red flag for investors is the ratio of corporate debt as a percentage of GDP, which is now at pre-recession highs. For the first quarter of 2017, the S&P 500 was up 5.5%, the Dow was up 4.5%, and the Nasdaq was up 9.8%. This report has been prepared by Metis Capital Management LLC. This report is for distribution only under such circumstances as may be permitted by applicable law. It has no regard to the specific investment objectives, financial situation or particular needs of any specific recipient. It is published solely for informational purposes and is not to be construed as a solicitation or an offer to buy or sell any securities or related financial instruments. No representation or warranty, either express or implied, is provided in relation to the accuracy, completeness or reliability of the information contained herein, nor is it intended to be a complete statement or summary of the securities, markets or developments referred to in the report. The report should not be regarded by recipients as a substitute for the exercise of their own judgment. Any opinions expressed in this report are subject to change without notice. The analysis contained herein is based on numerous assumptions. Different assumptions could result in materially different results. The analyst responsible for the preparation of this report may interact with trading desk personnel, sales personnel, other analysts, journalists, and other constituencies for the purpose of gathering, synthesizing and interpreting market information. Metis Capital Management LLC is under no obligation to update or keep current the information contained herein. The securities described herein may not be eligible for sale in all jurisdictions or to certain categories of investors. Options, derivative products and futures are not suitable for all investors, and trading in these instruments is considered risky. Mortgage and asset-backed securities may involve a high degree of risk and may be highly volatile in response to fluctuations in interest rates and other market conditions. Past performance is not necessarily indicative of future results. Foreign currency rates of exchange may adversely affect the value, price or income of any security or related instrument mentioned in this report. Metis Capital Management LLC accepts no liability for any loss or damage arising out of the use of all or any part of this report. Certain of the information contained in this presentation is based upon forward-looking statements, information and opinions, including descriptions of anticipated market changes and expectations of future activity. Metis believes that such statements, information, and opinions are based upon reasonable estimates and assumptions. However, forward-looking statements, information and opinions are inherently uncertain and actual events or results may differ materially from those reflected in the forward-looking statements. Therefore, undue reliance should not be placed on such forward-looking statements, information and opinions. 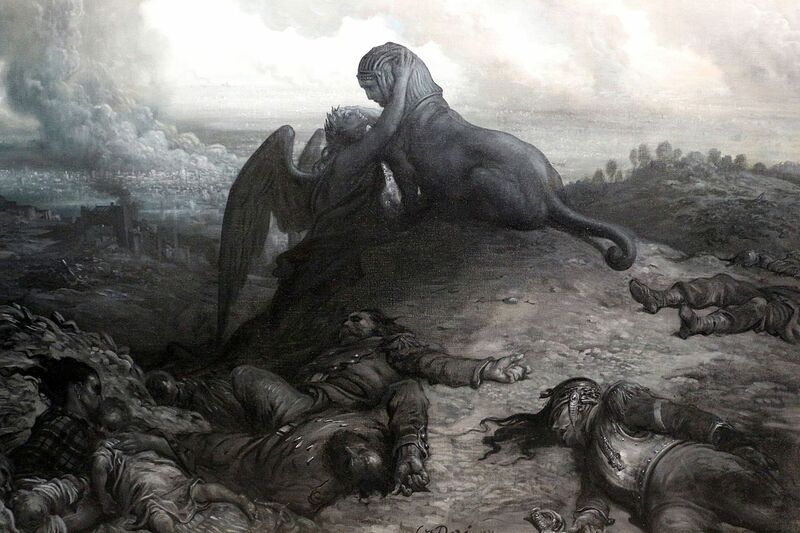 "L'Enigma", Gustave Doré, 1871. An embittered nation begs the Sphinx for answers. 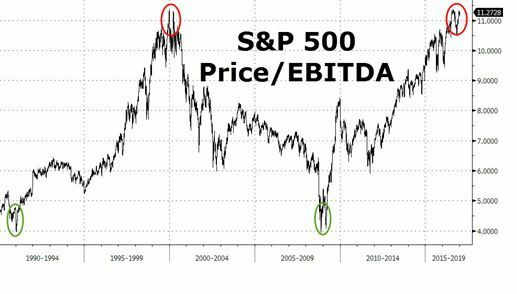 The post-election Trump rally appears to be cooling, and as it does, realization that stocks are as expensive as they were in 1999 on a price-to EBITDA* basis is setting in. The following chart is not a price chart of the stock market but a “valuation” chart of the S&P 500. (*EBITDA is earnings before interest, taxes, depreciation, and amortization). No one knows how the President elect’s policies will play out, but the stock market has rallied on hopes that he will provide huge fiscal stimulus on infrastructure projects, cut taxes, and decrease regulation. The stock market has been pricing in nothing but good news, and there is little basis for it so far. It has risen not based on earnings, but expanding stock multiples based upon the assumption that “everyone is a winner under Trump”. The bond market, on the other hand, has sold off severely since the election based on either fears of inflation or fears of remarks made by the President-elect concerning the full repayment of Treasury debt. This too is overdone because it assumes too much strength in the U.S. economy. Meanwhile, the U.S. dollar has surged against other world currencies, which have negative consequences for U.S. exporters. A strong dollar hurts exports, because it makes American goods more expensive abroad, and because when the foreign profits are repatriated, we get less US dollars for those sales. The reason for the dollar surge is due to anticipation of higher rates in the U.S. which widely anticipate inflationary policies like tariffs by the President-Elect. Approximately 45% of the revenues of the S&P 500 come from exports. Trump proposed during his campaign spending $1 trillion on infrastructure projects. Yet Republican lawmakers are looking for spending cuts. Trump wants to incent the private sector toward infrastructure spending with tax credits. Yet the only infrastructure projects which are profitable are new toll roads and new toll bridges. According to the American Society of Civil Engineers, $3.6 trillion of infrastructure spending is needed just to repair existing crumbling infrastructure. New toll roads and bridges are not needed, and the Republican Congress knows it. So Trump’s proposals for fiscal stimulus are at present very uncertain. Trump would like to cut taxes as well. While campaigning he promised tax cuts “to the middle class, the forgotten people, the forgotten men and women of this country, who built our country." In reality, the top 1% of wealth in the U.S. will reap around 50% of the benefits of personal income tax cuts. The other half will, nonetheless be stimulative to the economy. Similarly, cutting corporate taxes from 35% to 15% would be stimulative, but in all these measures some $6.2 trillion of lost revenue would be lost over the next ten years, which will ultimately hurt the economy in the form of higher rates enforced by further bond market selling. Again, time will tell if a fiscally conservative Congress will allow this. 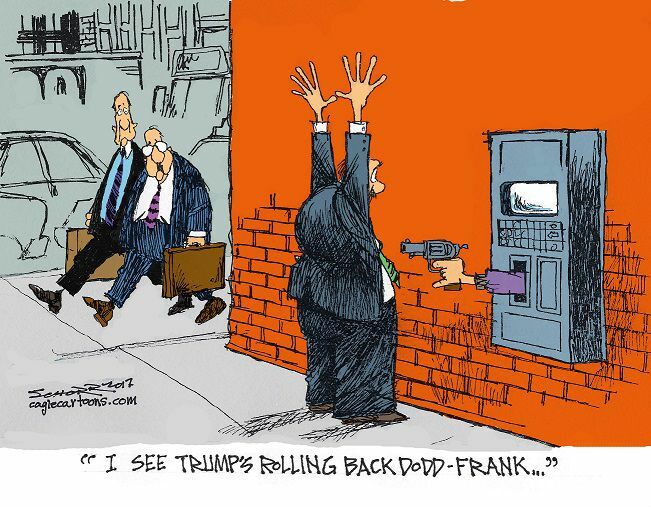 As for banking deregulation, Trump would like to eliminate the Dodd-Frank banking regulations put in place in 2010 to prevent future banking crises. Dodd-Frank has many critics, who feel that the law has hurt small banks and restricted access to credit. After running on an anti-Wall Street campaign, Trump has named three former Goldman Sachs executives to his cabinet. Since the election, Goldman Sachs share price has rallied by 52%, and that in turn is responsible for around 30% of the Dow’s rise since the election, since the Dow is a price weighted index. However, there are not enough votes in the Senate to overturn the Dodd-Frank Act, which is still widely supported by Democrats. For wealthy investors, it is difficult to argue with a Trump Presidency, which clearly will favor the wealthy. The President-elect has chosen the wealthiest cabinet in modern history, consisting of three billionaires (Ross, DeVos, Mnuchin), and several others each worth dozens of millions (Tillerson, Chao, Price). The Trump administration will seek to cut taxes and completely eliminate Federal estate taxes. While it is noble for these wealthy cabinet members to offer service to their country, it should be noted that according to the tax code, they will all be able to divest themselves of all stocks and bonds with full deferral of any capital gains, if they invest in either treasuries or certain money market funds, until such time that these treasuries or money market funds are sold. If they never sell them, then they can defer paying any capital gains tax forever. It would be lucrative indeed for anyone with extreme wealth to serve as a U.S. cabinet member. It remains to be seen if they will all be approved by Congress. The Federal Reserve lifted its benchmark federal-funds rate in December to a range between 0.50% and 0.75% and announced its intention to increase rates three more times in 2017. Two of the central-bank speakers have since suggested that more than three moves could be coming in 2017. The reason provided by the Fed is that the economy is improving, although if we consider that home ownership has hit a 51 year low, or the 2.3 million people who are “missing” from the unemployment statistics, or the fact that labor participation is near a 40 year low, it is with some skepticism that official GDP growth numbers should be taken at face value. The more likely reason why the Fed is suddenly afraid of the Trump administration’s inflationary policies. Last week, the Chinese Central Bank increased the overnight rate of interest to 105%, in an effort to prop up its currency. This unprecedented and disruptive move was designed to squeeze out speculators who have shorted the Yuan. Yet it is not just speculators who want to sell the currency. The government only allows Chinese to convert $50,000 worth of Yuan per year, and now that we have entered 2017, it is trying to restore confidence as money heads to the exit door again. Chinese savers are rightly concerned about the falling foreign currency reserves, as are Chinese businesses. Capital is flowing out of China, whose fundamentals argue for a weaker yuan. The behavior of the PBOC does little to further China’s advocacy to make the Yuan a reserve currency, which is approaching all-time lows against the USD and nears the psychologically important level of 7:1. In fact, the move hints at desperation. Between June of 2015 and January 2016, a weak Chinese currency led to a hard selloff in the Chinese stock market of 45%, which softened stock markets globally. The Taiwanese President just concluded a visit to the U.S. this weekend, after a phone call with Mr. Trump a few weeks ago angered Chinese Communist officials who have promised to take revenge on a perceived threat to their “One China” policy. The Communist Party’s 19th National Congress takes place this autumn, and given rumored rivalries between President Xi and Premier Li, the former is likely to respond forcefully against Trump given his own personal political stakes. The Trump transition team is considering between a 5-10% tariff on all imports, despite fierce opposition by Republican lawmakers and business leaders. Trump also has vowed to eliminate the NAFTA trade agreement with Canada and Mexico. He has also added two pro-tariff advisers to his economic policy team. If such actions lead to retaliation by America’s trade partners, which they surely will, this would lead to American job losses and result in a tax to consumers, both of which would harm the US economy. It may not be legal to impose such tariffs, because of existing trade treaties, particularly with the World Trade Organization. While many working class Americans think that this is a good thing for them (just as they did in 1931), it is actually a very bad idea because it will cause prices to increase, and potentially trigger a retaliatory trade war with former sovereign partners who themselves may block or tariff some of our major exports. Politicians opportunistically believe that it improves their status with working class voters to support tariffs, just as they did in 1931 when the Smoot-Hawley Tariff Act contributed to the Great Depression under the last businessman President Herbert Hoover. Moving jobs from low wage countries back to the United States, a high wage country, provides American companies with incentives to automate production with robots, in turn could increase unemployment. In the case of the Indiana Carrier plant, that is exactly what CEO Greg Hayes of parent company General Dynamics has promised to do in the face of Trump pressure to keep the plant in Indiana instead of moving it to Mexico. Trump Tweets have been causing huge market moves on individual stocks. Most recently Toyota, Lockheed Martin, General Electric, and Boeing have been impacted by the President-Elect’s 140 character messages. There now exists an iPhone app called “Trump Trigger” which alerts investors in real time when Mr. Trump mentions a publicly traded company on a Tweet. This amounts to an entirely new financial risk, heretofore unknown to investors. At this time, nothing is obvious because markets are overvalued and Trump is a great unknown and undefinable. He is a disrupter, a provoker, a temperamental opportunist, sensitive and easily aroused, as volatile as his outbursts on Twitter. The direction of all markets since the election has been built on euphoria and a belief that one man can change the status quo in the face of his own party which dislikes him. In a few weeks, earnings season begins for the fourth quarter, and those earnings are likely to be impacted by a U.S. dollar which now stands at 14 year highs vs other world currencies. If Trump declares a tax holiday on the $2.5 trillion of corporate foreign profits, the repatriation of this money will drive the dollar even higher, again a negative for exporters and likely to cause problems for many foreign countries which owe debt denominated in dollars. It is a mistake to believe that the repatriation of this capital will lead to new investment, which tends to be predicated mainly on opportunities for productivity/output gains from any such investments. Fund flows tend to be a good short term contrary indicator, and November and December just saw a record amount of stock buying and bond selling in November and December, mostly by retail investors who tend to pile in at market tops. There are a number indicators besides stock valuations which are flashing caution signals. The Bull/Bear ratio has become over-exuberant, and is indicating a pullback. While the “Economic Policy Uncertainty Index” is at an all-time high, the volatility, or fear index on U.S. stocks is near its all-time low. The same can be said for the corporate credit market, which paints a very rosy picture at a time when risks are unprecedented.